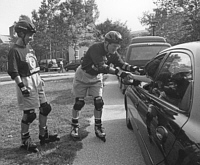 President William R. Brody and his wife, Wendy, don roller blades to get around the Homewood campus faster as they greet incoming students and their parents on moving-in day. The president has designated student aid endowment as the highest priority of the remaining years of the Johns Hopkins Initiative campaign. "Student aid is an issue that has become increasingly, but perhaps quietly, critical," says President Brody. On May 3, when the Board of Trustees raised the goal for the Johns Hopkins Initiative to $1.2 billion, they also endorsed President William R. Brody's recommendation that the number one priority for the increased funds would be endowment for student scholarships and fellowships. "It is an issue that has become increasingly, but perhaps quietly, critical," Dr. Brody explains. He elaborates below. Why is student aid such an important issue right now? Johns Hopkins has always been committed to making a Hopkins education possible for students of extraordinary merit and promise, regardless of finances. This has never been an easy thing to achieve, and it gets harder every year. Part of this has to do with rising tuition. Although we have slowed the rate of tuition increase for this year and for each of the next five years, a Hopkins education is expensive. The largest difficulty facing Hopkins as it competes for the most able students is the fact that our endowment is much lower than most of our peers'. Endowment is the best source of student aid funding, because it perpetuates itself and even grows. What is the impact of endowment on student aid? When endowment is insufficient for student aid funding, we must draw on other sources such as tuition and annual gifts--resources we also rely on to improve technology, renew laboratory and classroom facilities, enrich student life, and fund our libraries, for example. Compounding the situation today is the fact that some leading institutions, including Yale, Stanford, and Princeton, have announced that beginning this academic year they are increasing their spending from endowment income to augment significantly the aid they offer undergraduate students from middle-income families. We do not have the endowment available to do this. Meanwhile, for Hopkins' undergraduate programs at the Whiting and Krieger Schools, the proportion of students applying for financial aid has increased from 47% to 75% during the 1990s. At Princeton, endowment income covers 85% of undergraduate student aid; at Harvard, well over 50%; and at Stanford, more than 30% of student aid comes from endowment income. At Johns Hopkins that figure is 8%. The fact is that while our tuition falls in the mid-range of comparable universities, the amount of scholarship support we are able to offer students is among the lowest. At the School of Nursing, for example, we are able to meet less than 50% of student aid need each year. How has the situation affected student indebtedness at Hopkins? Throughout the divisions, students are increasingly obliged to take out loans, which means they are graduating with more and more indebtedness. This indebtedness, in turn, may have a negative impact on their early career choices--and on their ability to pursue further education. The average debt burden for Hopkins students at graduation ranges from $16,600 among Homewood undergraduates to $40,000 at the Nitze School of Advanced International Studies and $68,000 at the School of Medicine. What can be done to increase scholarships and fellowships at Hopkins? For all the reasons outlined above, we must increase our endowment for student financial aid throughout the University to ensure that no student need turn down the chance of a Hopkins education for lack of funds. Besides helping to meet this vital goal, private gifts for student aid endowment are singularly rewarding to our donors. They know that students for generations to come will benefit from their generosity, and many donors find great pleasure in meeting their scholarship or fellowship students and following their careers as they go on to contribute to society. We believe the best students deserve Hopkins. Private gifts for student aid endowment will make it possible for them to get the best education anywhere! Louis F. Forster, A&S '41, '48, is celebrating 20 years as a volunteer in the Alumni Relations Office. Despite a busy life off-campus, he reports for work three to four days a week, cheerfully sorting and delivering mail, proofreading brochures, labeling envelopes, and helping with Senior Alumni events. The former English teacher says it is a "privilege" to volunteer at the University. "During the Depression, Hopkins made it possible for me to attend college by giving me a substantial grant. I owe a great obligation." 1 Baltimore Chapter--Lecture with Professor Bruce Marsh, "An Antarctic Day in the Dry Valleys"
For further information, click on http://www.jhu.edu/~alumni/, or phone 410-516-0363 or 800-548- 5481. Last spring, with funding from the Alumni Association's Community Service Grant Program, Hopkins students landscaped and furnished the yard around a newly installed fish pond at the Don Miller House in Baltimore, a hospice for AIDS sufferers. The students found the project especially rewarding, as Walter Lin, co-director of AIDS Buddies, writes below. As you drive by, you can hardly notice the fishpond, since it's low in the ground, but now you notice that there's a little more color than before. Then you get out of your car, take the walk to the back, and are blown away by the elegance, the sound of trickling water, the plants, the fish, all in a Baltimore City neighborhood. AIDS Buddies has completed landscaping the area around the fishpond at the Don Miller House far ahead of schedule, and a celebratory party for the residents, staff, and their families and friends was held in June. As depicted in the accompanying picture, we have fulfilled our intent to beautify the backyard with a swinging bench, park bench, fencing, ornamental stones, and flower garden. The minor drainage problems that had flooded the basement when it rained were also fixed. We are truly grateful for the grant provided by the Alumni Association, without which completion would have been delayed; the Don Miller House staff and residents thank you as well. The backyard is now put to good use. Where before one passed it as one went down a familiar street without noticing particulars, now one has to stop, has to take a seat on the park bench, or the swinging bench if one prefers, and look at the fish as they swarm to the surface looking for a handout. Then with that one person, another comes, and they talk about the day, about the weather, about the fish, about their social organization, about anything; but they talk. Or they sit alone and meditate, but not really alone, because the fish are there, and their thoughts are not left unanswered to echo in a room but swirl with the sounds of the trickling water. It is a moment's hiatus that can stretch to a couple of hours until the afternoon heat pushes them back inside. It's a gift to them and was a wonderful experience for us. The labor was great, but the residents' reactions to each addition to the backyard, their willingness to keep us company while we worked, and the next door neighbor to help out, were all encouraging. The difference in the yard before the pond and after is startling, but already the pond feels as if it has always been there, the memory of the vacant lot fading fast against the present geometry of colors. The pond is permanent, and will be a lasting structure dedicated to the residents of the Don Miller House. We have amazed ourselves at what we can do and are thankful for the opportunity, for an experience that we could have only received going to the Johns Hopkins University in Baltimore. Over the summer, Hopkins alumni chapters across the nation and even abroad treated new and returning students to send-off festivities. At picnics, crab feasts, and pool parties, the students enjoyed the opportunity to socialize with other members of the Hopkins community before leaving home. The Alumni Association extends its warm appreciation to the alumni and parent hosts of these events for their gracious hospitality. Listed below in chronological order are the 19 alumni chapters which held send-off events, and their hosts. David Starobin, Peab '73, the only guitarist ever to receive Lincoln Center's Avery Fisher Career Prize, has been called by the New York Times "this country's preeminent interpreter of contemporary guitar works." Chairman of the Guitar Department at the Manhattan School of Music, Mr. Starobin performed at the school on October 1 in a concert that also featured Pulitzer Prize-winning composer George Crumb. The New York alumni chapter arranged for Johns Hopkins concert-goers to meet the artists following the performance. Erv Sekulow, A&S '59, SCS '76, a senior member of the Hopkins development team for 23 years, has been named executive director of alumni relations. He succeeds Jerry Schnydman, A&S '67, who in February was named executive assistant to University President William R. Brody. India Lowres, A&S '76, associate director of alumni relations, served as interim executive director. In announcing the appointment, Robert R. Lindgren, vice president for development and alumni relations, said, "After a long national search, we are delighted to name Erv Sekulow to this new role. In it he will continue to be a great asset both to the University and to Hopkins' 94,000 alumni." Mr. Sekulow served on the pivotal Alumni Relations Task Force in the 1980s that made recommendations to expand the involvement of alumni in University affairs. His posts on the development staff have included director of development for the Johns Hopkins Hospital and, most recently, executive director for institutional programs. As head of alumni relations, Mr. Sekulow will manage a staff of 11 focusing on activities and services for alumni, faculty, students, parents, and friends of the University. There are 37 regional alumni chapters in 24 states and D.C., as well as in Japan, Paris, South Korea, Thailand, and Taiwan. The staff also coordinates the 150-member Alumni Council, the governing body of the Alumni Association, which represents all of the academic divisions. James K. Archibald, A&S '71, of Baltimore, began a two-year term as Council president in October. "I believe I can speak for the whole Alumni Council in saying that we are extremely pleased with the selection of Erv Sekulow to head alumni relations at Johns Hopkins," Mr. Archibald said. "Over the years he has shown himself an effective leader and a true friend of Hopkins and of its alumni." The Johns Hopkins Alumni Association invites nominations for three prestigious awards to honor deserving graduates and friends of the Johns Hopkins University. The deadline for nominations is December 1. The Woodrow Wilson Award for Distinguished Government Service, established in 1990, honors alumni who have brought credit to the University by current or recent distinguished service as elected or appointed officials. The Heritage Award, established in 1973, honors alumni and friends of Johns Hopkins who have contributed outstanding service over an extended time to the progress of the University and the activities of the Alumni Association. The Distinguished Alumnus Award, established in 1978, honors alumni who have typified the Johns Hopkins tradition of excellence and have brought credit to the University by their personal accomplishments, professional achievements, or humanitarian service. To nominate someone for any of these awards, please submit the nominee's name, along with Hopkins affiliation and year; the name of the award; and a summary of specific reasons why the nominee deserves the award. Send the nomination--along with your own name, address, affiliation, and telephone number--to the JHU Alumni Association, Alumni Awards Nominations, 3211 North Charles Street, Baltimore, Maryland 21218. Fax: 410-516-6858; e-mail: rebeccab@jhu.edu. The 1999 undergraduate reunion classes (class years ending in "4" and "9") from the Schools of Arts and Sciences and Engineering will be celebrating their reunions over one Homecoming weekend next spring. This is a change from the past five years when reunion classes have returned to Homewood over two separate weekends. At the School of Public Health, individual departments are holding alumni celebrations throughout the academic year. GET IN TOUCH WITH JOHNS HOPKINS MAGAZINE.